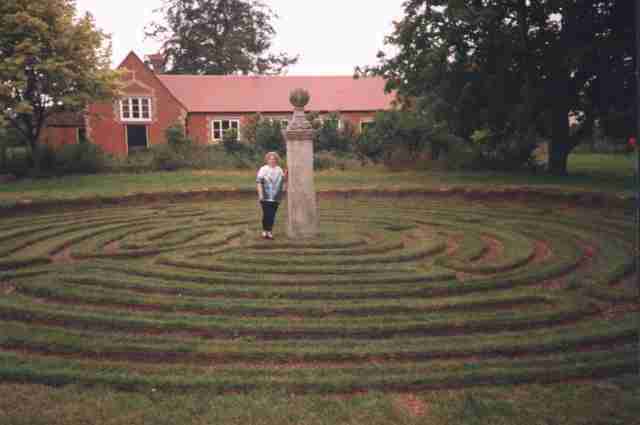 Over the last few years I have been fortunate enough to be able to visit all eight remaining English turf labyrinths, as well as the sites of two former ones. For the benefit of both existing and new enthusiasts I am able to present this updated report. Not all are easy to find or easily accessible, but all are well worth the effort involved in seeking them out. A small village in South Humberside approximately ten miles north of Scunthorpe. 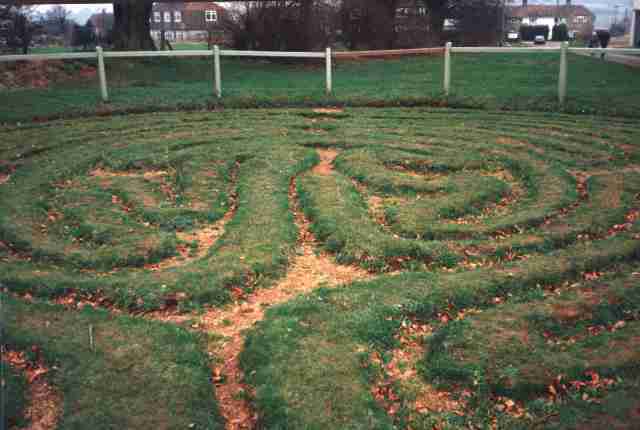 The maze, known as 'Julian's Bower' is very well signposted and easy to find. 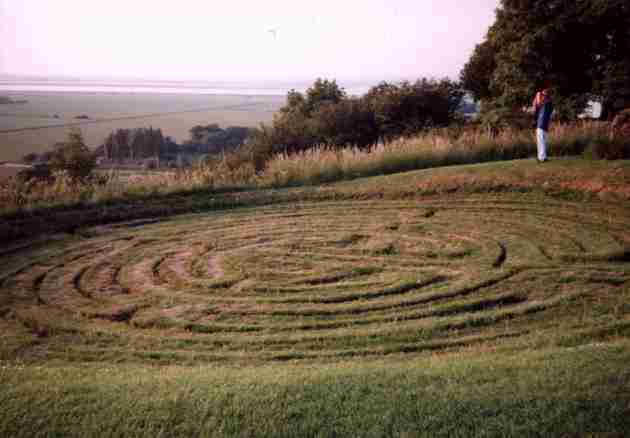 In a picturesque location, overlooking the confluence of the River Trent into the Humber estuary, the maze is 43.5 feet in diameter and of the 'Chartres' type, sunk in a circular hollow. It was rather worn-looking when I visited it in August 1992, following a dry spell, and the edges of the pathways were beginning to crumble. Hopefully, its condition will now have improved. Known as 'City of Troy', this is situated beside the road, on top of the Howardian Hills, approximately 13 miles north of York, between the villages of Brandsby and Dalby. Sometimes called the Skewsby maze because of its proximity to that village, it is approached by following the B1363 out of Brandsby as far as the crossroads. Turn right (signposted Dalby and Terrington) then sharp left. Continue for a mile or so, past a small wood on your right and you will see the maze surrounded by a low white wooden railing. 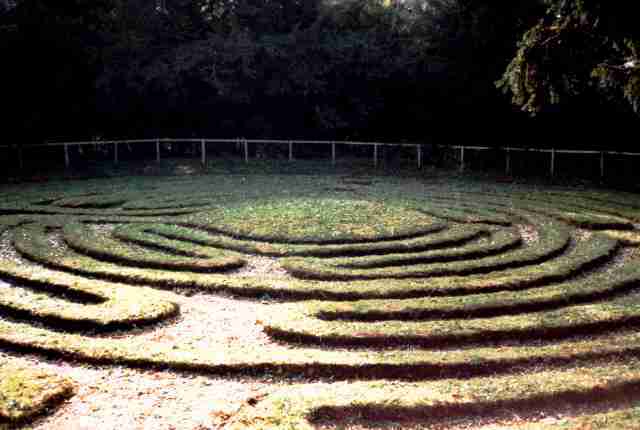 The maze is 26 by 22 feet, of 'classical' design and maintained in excellent condition. It is the smallest turf maze in Europe. The village of Wing is five miles south-east of Oakham in Leicestershire at the southern edge of Rutland Water. The maze is easy to find, being signposted as 'The Old Maze'. It stands at the roadside, surrounded by a white wooden fence, and is of 'Chartres' design and 50 feet in diameter. It remains in superb condition. 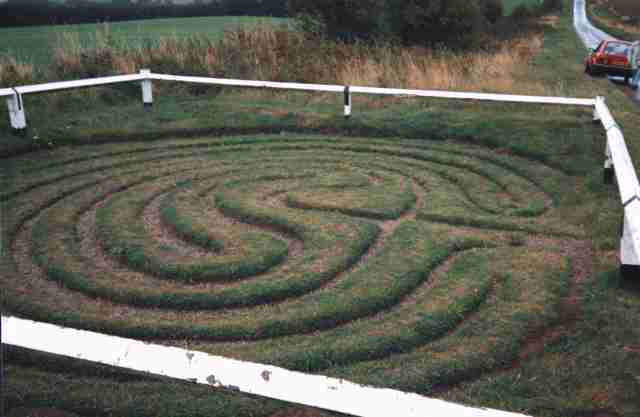 As the smallest turf maze in Europe is at Dalby, so is the largest traditional one is at Saffron Walden in Essex. 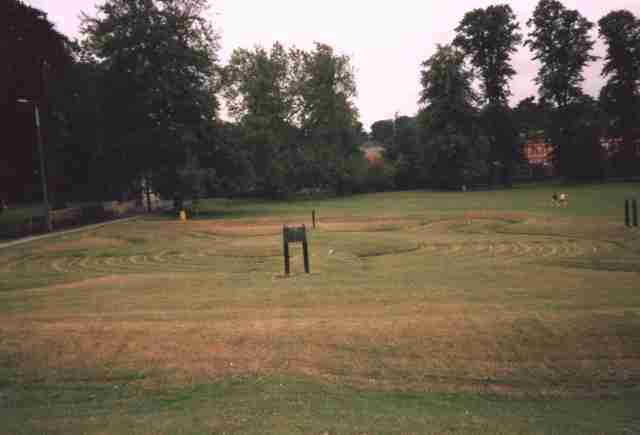 To be found on the Common, it has an overall diameter of 132 feet, including the four 'bastions'. The pathways are the brick-lined grooves rather than the turf ridges. This is again in excellent condition. Known as the 'Mizmaze', this is a square maze 90 by 86 feet, found on St Catherine's Hill, within an iron age hill fort to the south of Winchester. The maze is easy to find but the hill is not, as it is not signposted in any way. At the side of the A33, just beyond the junction with the minor road to Morestead there is a lay-by. The path to the hill is at the side of the lay-by and the hill fort to the left is unmistakable. If there has been recent rain, wellington boots are advisable! A steep climb up the path is rewarded with magnificent views across the surrounding countryside. The maze is to be found on the very top of the hill, to the right of the large clump of trees. I visited in October, when the grass was quite long. Although a cold, damp day but it was pleasing to see several children running around the pathways (which are grooves). Constant use makes the pathways clear, otherwise the maze would quickly be overgrown and lost. Probably better visited when the grass is short in the spring. Breamore is a small Hampshire village six miles south of Salisbury. A really beautiful maze, although not easy to find. I visited out of the holiday season and there was no one around to give directions. Luckily I had a copy of A walk to Breamore Miz-maze which gives very clear instructions for finding the maze. It is best found by following the public footpath through the grounds of Breamore House. It was rather muddy in parts, because of recent rain - appropriate footwear recommended! On leaving the woods the maze is well signposted. It is 84 by 81 feet in diameter, of 'Chartres' design, within its own small wood, the trees completely encircling it. It is scheduled ancient monument and fenced off, thus being impossible to walk upon, which is a little disappointing after the long walk to find it. However, it is in superb condition and a joy to visit. There are also two sites of former turf mazes, which could possibly at some time in the future be restored. 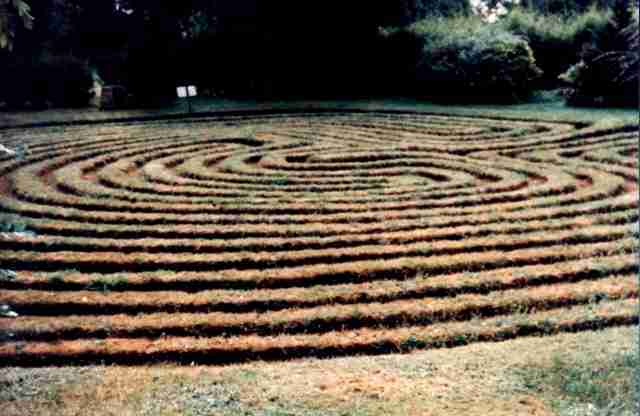 Perhaps one day we may have ten turf labyrinths! On the edge of the village of Asenby in Yorkshire, five miles south-west of Thirsk, there is a licensed restaurant 'The Crab and Lobster' (formerly 'The Shoulder of Mutton'). Behind the restaurant one finds the remains of a Norman motte and bailey. A public footpath is marked, which leads up onto the earthwork. The footpath starts at the end of the car park nearest to the restaurant. It is a very short climb onto the earthwork. 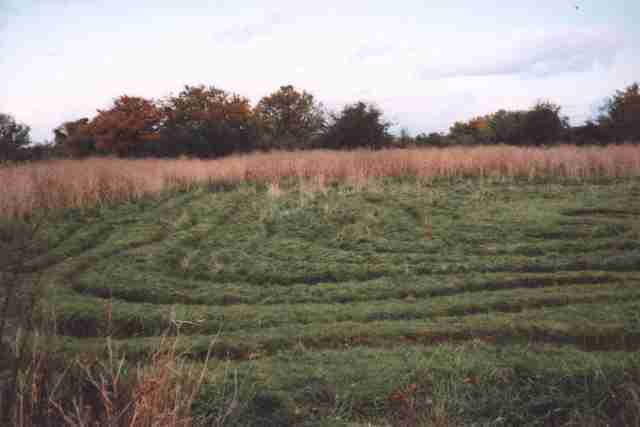 The ground slopes gently upwards to a roughly circular area approximately 51 feet in diameter, which is the site of the maze. All that remains are a few odd bumps in the ground. It is an attractive site which could be very much enhanced were the maze to be restored. Leigh is a small village in Dorset, six miles north-west of Cerne Abbas. The maze site is in a field alongside the minor road from Leigh to Chetnole on the right-hand side of the road at the top of a slight hill. A gate leads directly into the field and the maze site is ahead, on the highest point. Its hexagonal bank is still just discernable and surrounds an area approximately 65 feet in diameter. The uneven ground within the bank is all that remains of the maze. This site is on private land but is easily accessible, if somewhat muddy after rain. There is a preservation order on the site, so restoration is a distinct possibility. This article was first published in Caerdroia No.25, 1992 and reprinted in Mercian Mysteries No.18 February 1994.